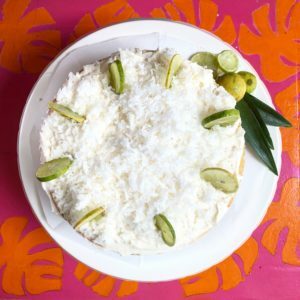 Tart, coconutty and simply out of this world. This gluten-free and dairy-free cake is a showstopper. 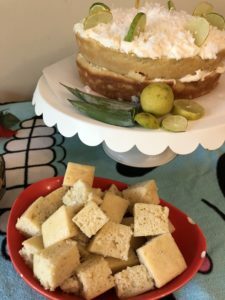 We served it at our Tiki-tastic annual tiki party and it disappeared! 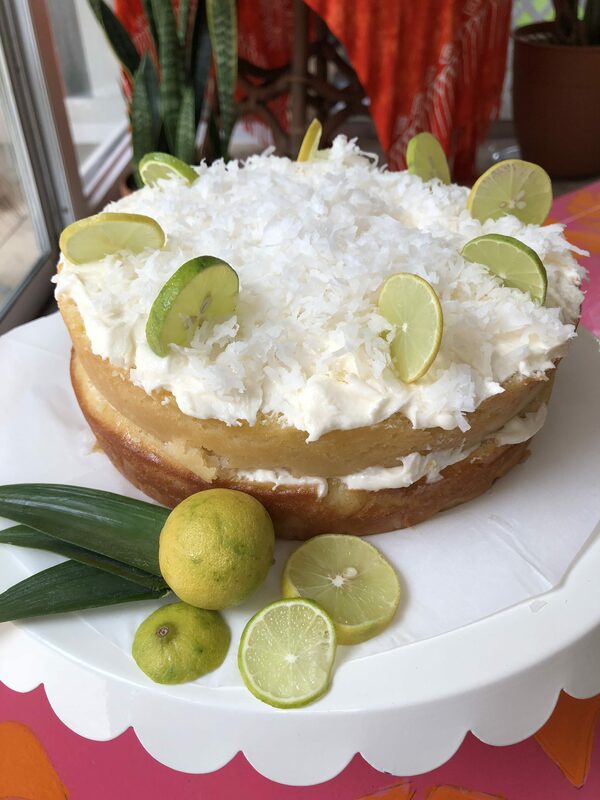 This cake is inspired by The Coconaut. It was originally mixed by Beachbum Berry who still shakes cocktails at Latitude 29 in New Orleans. Pour ingredients into a blender full of ice and then pulverize it until it’s a slushy, frothy, deliciously smooth mixture. Serves 2-4 people. My cake version is just as simple. Lots of key lime juice, plenty of coconut cream. So tasty. Preheat the oven to 350 degrees. Grease and flour 2 – 8 inch cake pans. Stir together the cake mix, eggs, oil, sour cream, key lime juice, milk, and zest in a mixing bowl. Beat on medium speed for 2 minutes. Divide the batter into the 2 prepared pans evenly. Bake for 26 minutes, or until a toothpick comes out clean. Place the pans on a cooling rack. Place the butter in a saucepan and heat over low heat until melted. Stir in the sugar and key lime juice. Bring to a boil. Reduce heat and simmer 1 minute. Remove from the heat and stir in the rum. Use a fork or skewer to poke holes all over the tops of the cakes in the pans. Drizzle the rum glaze evenly over both cakes. Let the cakes cool another 10 minutes in the pan. Place a piece of parchment paper over the tops of the cake and flip them out onto a plate. Place another plate on top of the cake and flip right side up. Let the cakes cool completely. Beat the butter and shortening until creamy. Add the coconut extract, rum, and salt and beat again. Slowly add the powdered sugar and cream of coconut until everything has been mixed in. Beat on high for 1-2 minutes, or until light and fluffy. 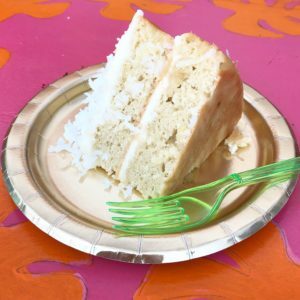 Use a sharp knife to gently level the tops of each cake layer. Save the cake for tiny cake bites. YUM! Place one cake on serving plate. Spread half the frosting on top of the cake. Place the last cake layer on top, and spread the remaining frosting on top. 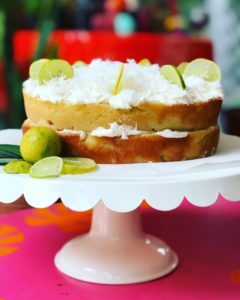 Top the cake with the key lime slices and shredded coconut.